Discussion in 'Windows 10 Help' started by talkingrock, Feb 3, 2019. HOW do I find the tmp folder? I know its a Windows folder, but the newer versions have made it near impossible to get to this to empty it, and the Temporary Internet Files folder, and I would like to empty both of those. Ideas? Thanks! Just run Windows own Disk Cleanup or run CCleaner. Just a heads up if you are going to install CCleaner. The standard installer contains an 'offer' to also install Avast Anti-Virus. It is pre-ticked so you must untick it if you don't want Avast. Many people simply don't look, hit the install button, and then start complaining that it has been installed without their permission. OK it should not be pre-ticked, but you should always look very carefully at any install screen to see if there is something 'bundled' there. 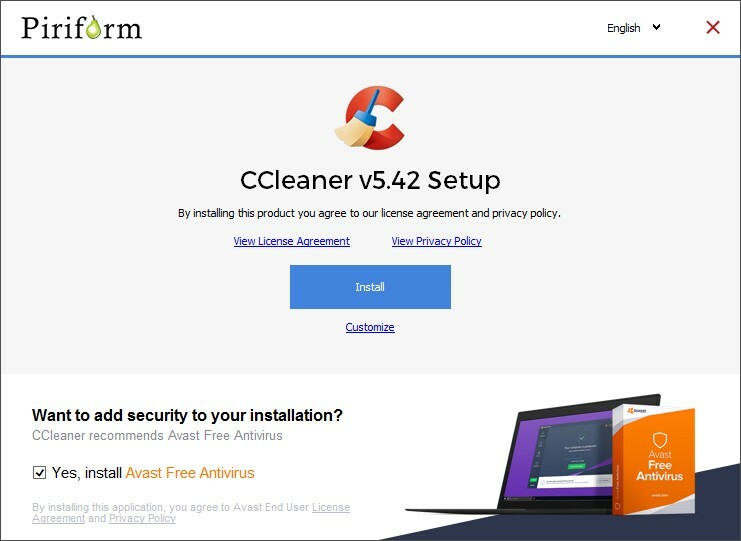 If you want to be absolutely sure to avoid this then go to the CCleaner 'builds' page and download the 'Slim' installer. That does not include any offers. Also - Don't use the Registry Cleaning function as a routine thing. Especially with Windows 10. Reg cleaners are a specialist tool for system recovery (usually following a malware infection). They will not speed up your PC or save much space. No they aren't. Registry cleaners are just that "cleaners" designed primarily to purge Registries of orphaned entries that are commonly left behind when programs and hardware are installed, uninstalled and updated. Whether that provides any value is frequently debated but I note there are many notable experts who use CCleaner's registry cleaner. And Windows 10 is NOT any more vulnerable to problems than previous versions. If anything, W10 is more robust, thus less susceptible. It should be noted the folks with Piriform (the developers of CCleaner) are not stupid. CCleaner has been around for 15 years and used by 100s of millions of users (including yours truly) on their systems without problems. If CCleaner was known to corrupt Windows, this feature would have been removed years ago. It is true, back in the day some Registry cleaners and Windows "optimizers" did more damage than good. CCleaner's was not one of them. So it is simply a mistake and frankly naive to lump CCleaner's registry cleaner in with all registry cleaners. They are not all created equal. CCleaner's Registry cleaner is the only one I use or would recommend. This is because (1) it is NOT very aggressive and it does not use results to scare and sucker you into spending money. That is, it does not suddenly find 1000s of "errors" and report they are dangerous to your system, then want you to spend money to clean them up. And (2) it always prompts to backup your Registry before making any changes. And (3) restoring from that backup works. Note I have never needed to restore from the backup, but I have tested it several times over the years and, as noted, it worked. And frankly, if one is going to use CCleaner's Registry cleaner, it should be done "as a routine thing" as opposed to once out of the blue. Registry cleaners, including CCleaner's should not be used to "fix" Windows - but to maintain it. I use mine after every OS install. After every major OS upgrade. After every major MS Office upgrade. After swapping out major hardware (like graphics cards). And after uninstalling security software and other programs that like to sink hooks deep into the kernel. I do, however, agree to watching out for add-ons during the initial installation. This, of course is what you should do with any program you download and install. But I should have cautioned about that. I will note, however, that CCleaner will not keep bugging you to install any extras after the initial install. To be sure, I am not recommending anyone go out, get CCleaner and run the Registry cleaner on their systems. This is especially true is their system is not new and has never had CCleaner's Registry cleaner run on it. But if a brand new system (or just had a fresh OS install on it), I would not hesitate to use it. And too that, make sure the prompt to make a backup of the Registry is ticked. It usually takes 2 or 3 runs to clear or fix all the entries. Sorry Digirati, but I believe that your thinking on reg cleaners is out of date. Have you read the above link to Microsofts view on registry cleaners? The issue with Win 10 in particular is that it gets updates at least monthly, often more frequently that that. It makes it a constantly moving target for 3rd party developers. These udates may include registry changes, or new registry entries, that reg cleaners do not recognise and so will wrongly remove. This wasn't a big problem with older Windows versions, because they didn't get so many updates. I'm well aware of Piriforms' previous reputation and trust, I'm also aware of current developments. I am a regular on their forum. (I note you are also a member there, although not a regular, and you haven't visited in a while). You may notice that since Avast acquired the company user trust is being rapidly lost. Long time supporters who would automatically recommend it as a 'go to' have stopped recommending it. I'm one, I've actually removed it from friends PCs who I had recommended it to and installed for them, although I still help others having problems with it. (All good things come to an end, often when new owners come along). Other features in CCleaner that proved to corrupt Windows 10 have been removed, after many complaints. One was the cleaning of 'Old Windows Updates'. As mentioned above Windows 10 works differently with regard to updates, and CCleaner was corrupting this process by removing files before Windows had finished with them. (Which in some cases can be days or weeks after the update). As for CCleaners registry cleaner, yes it's more 'gentle' than some others, but it still 'breaks' machines - regularly. The forum regulars and moderators have suggested often to Piriform that they make it less visible/tempting for non-techie users, but those requests have fallen on deaf ears. We get cries for help all the time on the forum from people who have used the CCleaner reg cleaner and left their machine crippled or unusable. Often it goes along the lines of "I've always used it weekly and it's never broken my machine before". (PS. Having made a backup before 'Fixing' the registry was of no help in this case). Obviously it's up to you whether you take the risk of routinely running a reg cleaner for very little, if any, gain. But I respectfully suggest to you that it may be time for a rethink. Actually, it is yours that is out of date. Note that MS article is there to relieve MS of any responsibility should something go wrong. And for sure, any time you dink with the Registry, something can go wrong. Hence the need to backup the Registry before making changes. Also note I did not recommend users use it. My concern is folks automatically jumping into threads to lump CCleaner in with all Registry cleaners. Now this thread is not about Registry cleaners, so this line of discussion must end now. Ok folks, thanks! I wanted to clean out the TIF's and the tmp folder. Did that, and it seems some faster. Thanks! Great! A lot of times, even if it just "seems" faster that is good enough. Do keep eye on your free disk space. Don't pay attention to anyone who says you need to keep a certain percentage of the total space free. That's just nonsense. The OS does not care about total disk space, only how much free space it has. So I recommend at least 20GB, preferably at least 30GB free. This gives the OS plenty of room for opening files, saving temp files, to temporarily store fragments during automatic defragging (if a hard drive), and for the Page File to dynamically adjust size as needed.